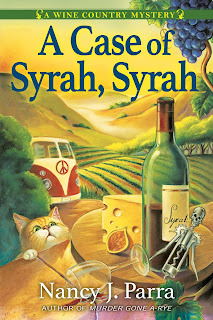 Hi all, Taylor O'Brian here from Sonoma, California. I'm so proud to debut my new series. When my Aunt Jemma had a heart attack, I left my high paying job in advertising and gave up my condo in San Francisco to come to live in my aunt's pool house. Luckily, Aunt Jemma seems none the worse for wear after her attack. The only problem is that every time I even think of returning to my old life, Aunt Jemma feels a twinge. So, I've decided that I'm going to stay and make a new life in Sonoma. I grew up in this famous small town among the golden hills and the vineyards large and small. The sweet scent of wine grapes in every season and the friends old and new made my decision easy. The problem is making wine isn't really my passion and it has to be a passion to do it well. But that doesn't mean I can't make a name for myself in Sonoma. I plan to do just that with my Off The Beaten Path wine country tours. I bought an old VW van that holds a nice group of seven. It's perfect for touring all the quirky gardens, hikes and small wineries in Sonoma and Napa Counties. My kitty, Clemmie, is not a fan of touring, but she keeps Aunt Jemma company while I have fun. Or that's what I imagined it would be like. I never imagined that anyone would be murdered on one of my tours, or that I would be suspected of the crime. Now it's up to me and my friends to solve the crime before my tour business has to close for good. 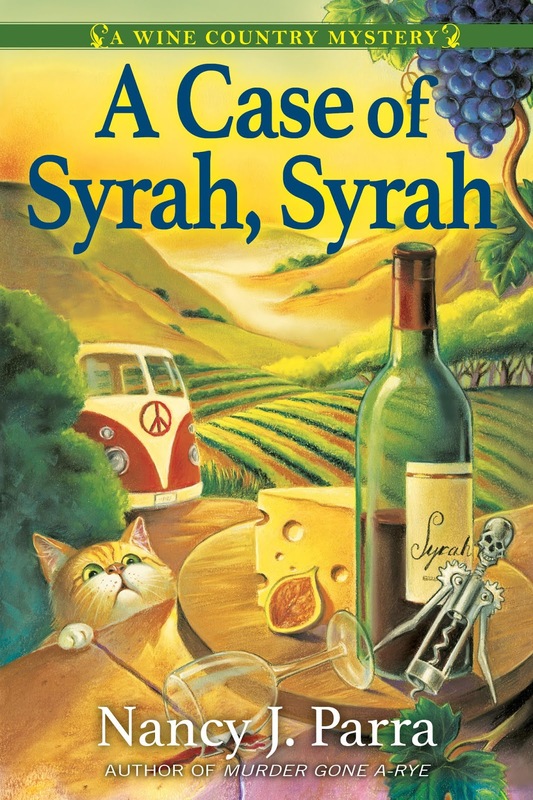 A Case of Syrah, Syrah is out December 12, 2017. Happy, Holidays! I'm giving away a hardcover copy of this book. Simply leave a comment telling me what your favorite holiday beverage is and one lucky winner will be picked at random. Best of luck! I can't wait to read this! My family and I love cranberry ginger ale during the holidays. hot apple cider, hot chocolate with marshmallows and maybe a wee bit of egg nog! suepete12 at yahoo dot com. My favourite holiday beverage is egg nog. We're not drinkers in my family (don't ask about the 60's though). These days I keep 4 or 5 bottles of various late harvest red and whites in the closet for dinners of Sabbath meals. Too much work and way too many calories, but oh so yummy. Glogg/grog is pretty nice, too. Hot chocolate with mini marshmallows for me!! I like eggnog but can’t have the dairy anymore. Or the calories. I used to work in a hospital x-ray dept where the head radiologist brought in gallons of homemade eggnog. It was spiked, of course, but very delicious. I haven't had it in many years. dbahn(at)iw(dot)net. Hot coffee (mocha) or cocoa. My favorite beverage is hit chocolate with whipped cream. My favorite holiday beverage is coffee with Bailey's. That is so fantastic..thank you so much..try the punch, you'll love it..
My favorite holiday beverage has to be hot spiced cider. I guess it goes back to the "old days" when you couldn't get or have certain things but during the Christmas holiday. I still associate hot spiced cider with Christmas. That is the only time I drink it, but I sure love it then. Always brings back happy memories of Christmas' past too. My favorite beverage this time of year is hot spiced apple cider. Warm, sweet, and a kick of cinnamon for good measure! I do enjoy a glass of white wine. I guess my favorite beverage is coffee, black, no cream, no sugar. It must be since I drink so much of it. BUT, I do enjoy a glass of white wine. Hubby & I take spells of having a glass in the evening, going through 2 or3 bottles in the 'spell.' Our daughter is an alcoholic so we do not serve it at family/holiday meals. Snow coke. Of course you need fresh snow to have it. Hot buttered rum or hot chocolate with peppermint snhaps. I like hot apple cider that has been steeping with cinnamon! Chai tea for sure. The spicy taste reminds me of good things cooking in a kitchen. Favorite beverage for this time of the year: Hot Chocolate with lots of whipped cream! Love the cover of this book! I like hot chocolate with whipped cream! I love a good Tom and Jerry----just wish I had the recipe that my father used to make it. It's a toss up between hot apple cider, mulled wine, or my usual champagne! My favorite wine normally is Pinot Grigio. For the holidays I live sparkling wines with an occasional eggnog thrown in. My favorite Is Baileys Irish Cream sometimes in Eggnog but mostly just straight! hot chocolate or spiced apple cider are great.